Graphene is the strongest material ever tested, but does its infusion into the rubber sole of Inov-8’s Roclite 345 GTX make this boot ideal for hillgoers? Inov-8 transformed lightweight footwear in 2007 when it released its first super-light boot, the Roclite 390 GTX, which set new standards in how light and yet functional a hillwalking boot could be. Fast-forward to winter 2018 and the brand is the first to unveil a hiking boot using graphene, the strongest material ever tested, and so revolutionary that Andre Geim and Konstantin Novoselov from the University of Manchester won the Nobel Prize in Physics in 2010 for groundbreaking experiments using the material. Graphene has many properties. Aside from its unprecedented strength, it conducts heat and electricity efficiently and is nearly transparent. It also shows a greater ability to distribute force from an impact than any known material, but despite its strength, graphene is also relatively brittle, like ceramic materials, so it needs to be used correctly to make the most of its benefits. on-going research to see how it can be used to replace lithium-ion batteries. But outdoor footwear brand Inov-8 is looking to graphene’s strength, hardness and elasticity to improve the performance of sole units fitted to its range of super-light running and fast hiking footwear. Until now, outdoor brands have had to choose between a sole rubber that was sticky and grippy but wears down quickly, or a sole rubber that was hard wearing but not very sticky or grippy. According to testing carried out by Inov-8 with the National Graphene Institute at The University of Manchester the use of graphene can mean we can have the best of both worlds. Inov-8 claims the infusion of graphene into its rubber soles increases strength, wear and elasticity by 50% and this is how its sole units display improved wear, as well as improved grip. Inov-8 has incorporated graphene into three running shoe designs and three light hiking boot designs, with the Roclite 345 GTX featured here being intended for those who want a lightweight boot for fast and light hiking or trekking. 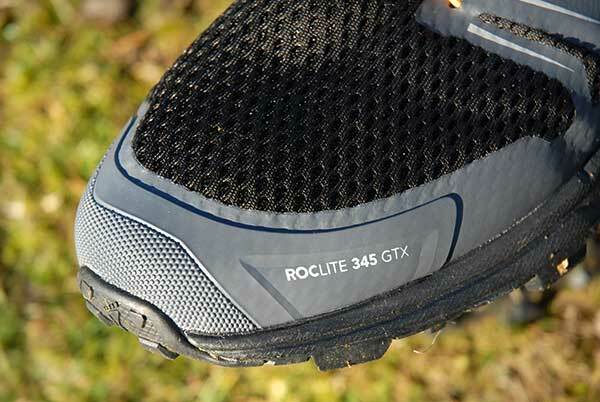 I took the Roclite 345 GTX into the fells of the Lake District to see how it performs. The boot weighs just 802g (size 11 pair), so on the foot it is instantly light and comfortable, like all Inov-8 footwear. Underfoot the new G-Grip sole features the graphene, but on first appearance it looks a lot like other Inov-8 sole units, as it carries a good selection of deep and well-spaced lugs or studs. Head onto the hills and the grip is great. How the boot will wear down over time has yet to be put to the test by users, but according to Inov-8 they should last longer than other shoes. Equally important is the construction and features of the rest of the sole. So there is some good stiffness, so you can stand on jagged rocks without too much pressure on the foot, but you also get a nice toe flex to allow a natural fast stride action across the terrain. There is also good cushioning in the sole, to limit the pounding from harder surfaces. The upper is reasonably supportive around the ankle and heel areas for this type of fast-moving shoe while the forefoot upper is more flexible to allow this area to move as needed with the foot when moving fast. To protect the feet you get a Gore-Tex waterproof lining on the inside and this is protected by lightweight open mesh at the forefoot with layers of synthetic materials in other areas to resist abrasion. The toe box is very soft though, and that mesh upper will, of course, be less durable than some other materials. Overall this is a promising development for anyone whose priority is for low weight and fast hiking. I will definitely be using the Roclite 345 GTX for speeding up my local Lakeland fells on shorter trips. They will also be great for trekking abroad in warmer weather on paths and trails that are well maintained. I will be sticking with heavier boots for general bigger and rockier mountain and Munro trips though, due to the extra support and protection they provide. Only time will tell how durable this sole unit will be, but I am expecting them to outlast previous Inov-8 footwear due to the well-researched benefits of graphene, probably one of the most exciting new materials to step into the outdoors. Inov-8 has revolutionised lightweight footwear since 2007 and today it is once again taking the outdoors a step away from conventional thinking with its inclusion of graphene into the sole units of its footwear. Only time will tell how durable the new sole rubber will be, but the Roclite 345 GTX is an exciting radical new boot for anyone looking to travel fast and light across the hills.